This excellent Bluetooth speaker has one advantage that most speakers don’t have, even if they come equipped with the same superior technology. It is waterproof, which means that you will be able to take it along with you on trips where weather changes can make the environment not the most suitable for using electronics. If there is one thing that users don’t seem to be particularly happy about is that they need to restart the app in order to control the lights, even if the speaker is already in operation. Otherwise, they say that the Bluetooth connection is flawless, and hooking up the speaker with any smartphone appears to be very easy. A waterproof speaker for the more adventurous hiker or outdoor enthusiast, the KING RVM2001 is your ideal ally for your trips to the great outdoors in your RV. It is true that other technical aspects matter, but compared to other units that offer the same specs, this one stands out by providing you with excellent means to listen to your favorite music in the wild. The housing is waterproof, and the unit has an IPX5 rating. This means that even if the speaker is splashed with water by accident, or because it suddenly starts raining, it will not allow the droplets of liquid to reach inside, and damage the delicate electronic components. Excellent connectivity makes this unit a good option for anyone who loves to go RV camping. Also, the manufacturer includes access to a free app that will allow you to adjust some properties directly from your phone. Music equalizer and bass are two specs you can fiddle with. You will love how easy it is to operate the lights, using the same app. Users can hardwire their lights to their RVs, to replace existing lights, and they can use their app and phones to control the light intensity and color, as they see fit. The available orange light mode is ideal for chasing away bugs, so it is safe to say that this product is more than just a speaker. You can quickly hook up this unit with your smartphone or your tablet. Listening to music while you go camping has never been more comfortable. The sound quality is also decent. While we talked a little about how you can use the app provided by the manufacturer to control the lights from your phone, we should say a few things about this feature, too. 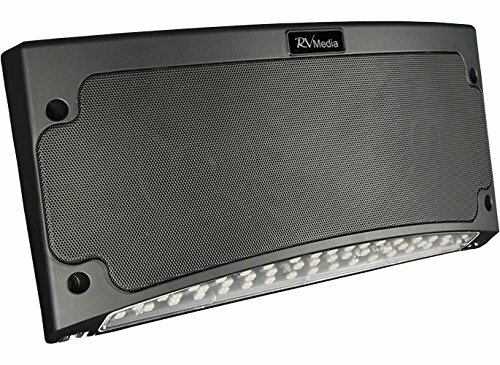 The 45 LED lights available will provide enough light so you can use them as a replacement for your RV lights. You only have to hardwire the unit to your RV, and the best thing about this part is that you will not have any need for batteries. Using the provided app, you will be able to control the lights and dim them as you need.